This week I’ve continued my training for Nepal. I ran twice on Tuesday, a very slow 25 minute 3 miler with some guys at work at lunchtime as a recovery run from the last weekends effort, then followed it up with an hour on the Hypoxia machine at the altitude centre after work (about 6 miles). On Wednesday I did a core strength session in the gym and on Wednesday night went on the Hypoxia machine again. On Thursday I did a fast 3 mile run at lunch and again on the Hypoxia machine in the evening. I hope to get some altitude acclimation by the time I get to Nepal (we are running up to 3500M altitude there), but I’m using the Hypoxia as much to try and jump-start my fitness a little. I’m nowhere near as fit as I was 18 months ago, so I’m trying more or less everything to try and improve that as much as I am able in the next 6 weeks. Got up very early on Saturday morning, around 5:15, and travelled down to Talybont-on-Usk near Brecon in Wales to take part in the 20 mile Talybont Trial. 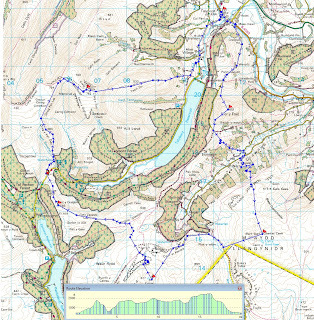 The route has 1500M of ascent and some very challenging terrain it transpired. I arrived with another Nepal competitor Tiffany, who was using the session to get some hill training in too. We arrived shortly after 8am, and most competitors were already en- route. There was a very thorough kit check by the Brecon Mountain Rescue Team. The event is a fundraiser for them, and they did an excellent job of manning the checkpoints in some pretty cold conditions up on the tops of the hills all day, as well as providing food and drink and the start/finish and around the half way mark. I carried around 4-5Kg in my pack, not all of it required, but simply to get used to running with weight for Nepal. We set off about 8:20 and joined the TT20 route which this year was run in a clockwise direction. After half a K of running we slowed to walk on a road which wound its way around to the bottom of the first big climb of the day up to Tor Y Foel (551M), a gain of 400M. It was a good climb to get the calves burning and warm up. That said, at the top everyone was fairly hastily adding their windproof/waterproof layer as it blustery and very cold. Aside from that though, the weather all day was much better than I anticipated, with no rain and largely cloud-free summits. There was an easy descent on a good path, and then my first opportunity to brush up on my nav skills. I couldn’t for the life of me find my GPS the night before, so I was doing it the old fashioned way with map and compass. I’m really sharp with my navigation anyway, so it doesn’t faze me, I just generally use GPS because it’s faster. I picked out the right bearing and we headed down across fields and ultimately down to a road and then another stiff climb up to 510M. Here's the view down and accross to that next climb. It lead onto bleak moorland where I took a bearing for the Chartists Cave and CP1. The visibility was all of a sudden really excellent with sun shine and blue skies for 10 mins, but I can imagine in poor conditions the CP would be a challenge to find if the bearing just off just slightly. It was 2K over very rough ground, which we opted to walk for the sake of risking twisted ankles this close to the event. We got to CP1, and took a quick look at the Chartists Cave before taking a bearing for CP2. We picked up a wide easy path and ran down to a road where 95% of the people we could see ahead had turned sharp right and were walking up the road, instead of bearing straight for CP2 over moorland. A nearby walker told us that the we’d definitely be better taking the longer road option, and cutting onto moorland later as the terrain was very rough the direct route. I was more than happy to take local advice and we did just that, running on the steady incline road for 2k. A picture of the surrounding views as I ran below. We left the tarmac road on initially wide off-road path, and then a ‘no-path’ slow ‘yomp’ through rough moor up towards the next trig point CP2. The cloud dropped at this point and we lost site of the trig, but it wasn’t that hard to find just very slow going walking on the moor which was littered which shake holes of varying depths which we meandered around. So it was very much a wandering path, rather than a straight bearing. It seemed to take a long time to cover what was little more than 1K, locate the mist covered CP, and then take another bearing roughly north towards some old mine workings, and a quarry. Again, it was dodge the sink holes and pick your line to try and avoid losing altitude just to gain it again before we emerged on a road on the side of the quarry. It was quite sudden actually, and in mist you’d have to be cautious not to drop straight off a 30M sheer drop (it is marked on newer versions of the OS map, but not older ones!) On that path we were able to run again, down into the quarry, through the other side and then continued the run on reasonable ground up towards Pant Y Creigau (565M), where CP3 was located. Apart from the last half k which was steeper, we had strung together as much running as we’d managed all day in that section. We ran down about 1.5K to the car park where there was a refreshment van. We had some biscuits and a couple of cups of juice and were ready to head out, when out of kindness I made what turned out to be a poor decision. Another participant, who was ‘running’ the event, asked if he could tag along with us so he didn’t get lost getting towards the next CP. I told him that there was only 1 path to it, and no mist so there practically no chance he could miss it anyway. He said that he’d already missed 1 checkpoint (though I suspect he’d actually missed at least 2 of the previous checkpoints) as he was unable to find them. He said he’d started 10 minutes after us, and we hadn’t seen him all day, and later, seeing the speed he moved at there was no way he’d followed much of the correct route so far and arrived at the refreshment point at the time he did. At this point the alarm bells were ringing. He was mid 60’s, very poorly equipped, wearing very old extensively repaired road shoes, he had no back pack, so I have no idea where his safety kit was or how he passed the kit check). More concerning was that he clearly couldn’t navigate any near well enough to be doing this event. I suggested we wait for the couple of people that were walking but he starting moaning (I don’t use that phrase lightly) about us making a promise to him. I said ok we could follow but as soon as the path to the CP became unmissable then we’d leave him. He kicked up a huge moaning fuss again, interrupting me, and being very obstinate and to be honest, very cantankerous. We set off, and me and Tiffany were already realising we’d made a bad decision as he was expecting his hand held all the way to the next CP about 3 miles away. There were lots of wild fell ponies around all day, pictured below. There was a tough climb up to Craig Y Fan Ddu (683M). View from the top below. At the top there was a fantastic ridge run, just one path and asking to be run at, except it transpired that he couldn’t run. We weren’t very happy, and I said that I’d walk as far as the end of the ridge, then as soon as we turned right onto Craig Pwfla (762M) we’d head off. He starting moaning and winging like you wouldn’t believe, and I was cursing my decision to agree to head out of the previous CP with him. I tried to get him to wait for a group of people that were about 1k behind, but no joy. The visibility was near perfect so there was no chance of getting lost up there. So, we had to walk for about 2 miles when we should have been enjoying a great ridge run. Here is the view looking back the way we came. Then the right turn came, and I pointed out to him to glaringly obvious path to initially take, and he the moaning began, he said he wouldn’t find the next CP. I told him that all he had to do was to head along the path initially and then head upwards to find the trig which was by definition the highest part of the hill. Also, we’d still be in sight for the whole way as it was less than 1.5K anyway. How could you go wrong? He starting interrupting and being very rude, at which point I’d had enough and told him that if he continued to give me earache, I’d set off at a fast run and it’d be the last time he saw me. At this point he started just saying “leave me, you don’t care what happens to me etc”. It was like a “leave me to die here” speech! Talk about melodramatics. If it was bad weather, he was injured, or there was any possibility he couldn’t literally fall into the next CP I’d have been happy to hold his hand, but as it was, none of those things applied. However I was sufficiently cross to put a good 100M distance between me and him and continue to head up the hill. Tiffany, was more sympathetic/concerned and wanted to phone the organisers to let them know where he was. She asked him his name, and he refused to give it to her, saying “go on leave me here etc”. You can’t help some people can you? Besides, I said it wasn’t necessary and he’d be in sight of us constantly as we weren’t running up the hill anyway. Without dragging the story out anymore we reached the CP with this guy 1 minute behind us. I warned the very nice Mountain Rescue guys at the CP that he was a liability and couldn’t navigate, and that I was absolving myself of any further responsibility since we’d delivered him as promised to that CP; we’d be running on from that point. He arrived at this point and starting making gestures of apology to me, but I told him that he shouldn’t be up there if he didn’t have the necessary skills to navigate. I shook his hand and we shot off, very happy to leave him behind. We ran on the next bearing, on what was a wide motorway of a path all the way off the mountain. 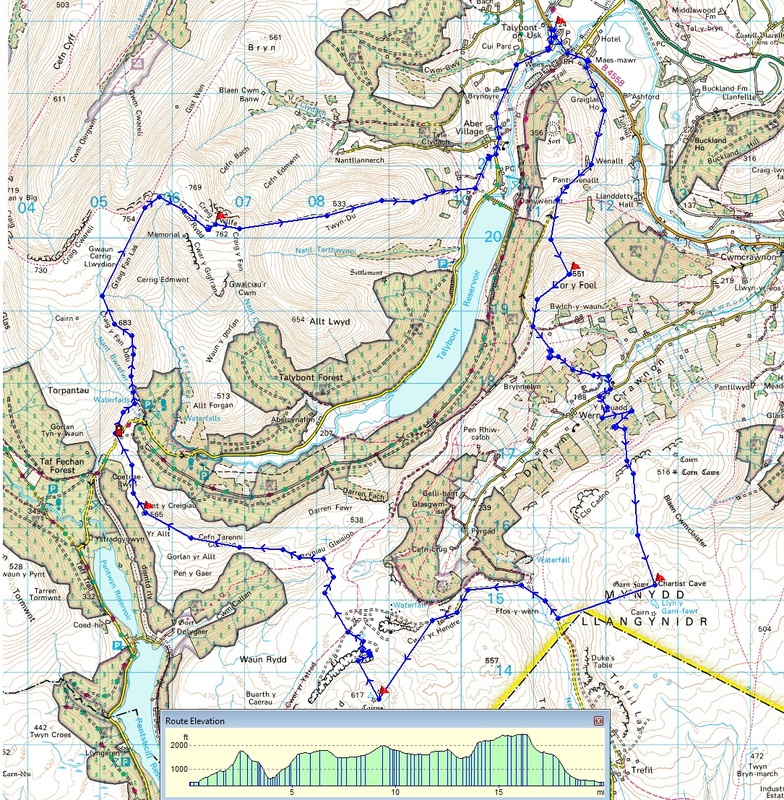 There was great running all the way down to Twyn Du (533M) and then further down to the corner of the Talybont Reservoir and then 2K on the road back to Talybont-on-Usk. It took us a little over 6 hours. So a very slow pace, but we lost at least half an hour guiding the nameless guy on the one straight path. I’m sure I’ve seen the guys face at LDWA events before, and I don’t imagine for one second I’m the first person to find him disagreeable. He can count his cards marked for future events; I’ll be avoiding him. A big thank you to all the organisers, and again thanks to the guys from the Brecon MRT who were huddled behind trig points in their big jackets, or sheltering in their tents on some very cold mountain tops. It was a big change from last weekend’s Indian summer in Wales. This coming week it’ll be more of the same training during the week. I don’t have an event next weekend, but I’ll doubtless get a few miles in at some point. The week after it’s the 50 miler (2700M +/0) in Andalucía, Spain. Hi Rich, great to see your blog updated and that you are still going to Nepal! Sounds as though you have regained a lot of your former fitness. That guy sounds a nightmare- I will be keeping a lookout for him on any future events! Hi Steph. Nice to hear from you. I'm very much untested in multi day terms, I haven't done a back to back event for 18 months since the Atacama desert; that's what is likely to catch me out I think. I'm hoping for the best. Good to see you're still doing plenty of events too.